Man lots of posting this week... it's actually starting to weird me out, haha. Actually I've been taking a break from other life duties (aka video games) and devoting more time to my nail related things. I don't think you guys have noticed but I actually have two really bad breaks. Both are currently in repair mode but with so much polishing, one almost came completely off last night. I'm trying to keep my length until I finish a few projects but I will have to rock nubs at one point. Let's not dwell on it and instead let's look at some pretty indies. 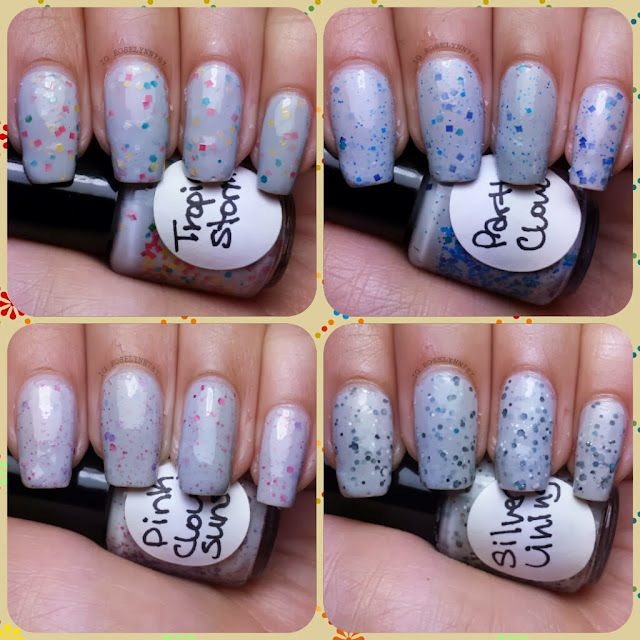 Today I'm sharing the Cloudy Skies Collection by Supernatural Lacquer. I'm going to be honest here... I'm super pumped for this collection. This is my first time trying Supernatural Lacquer so a special thank you to Stefanie for allowing me to review for her. It's always a great honor. 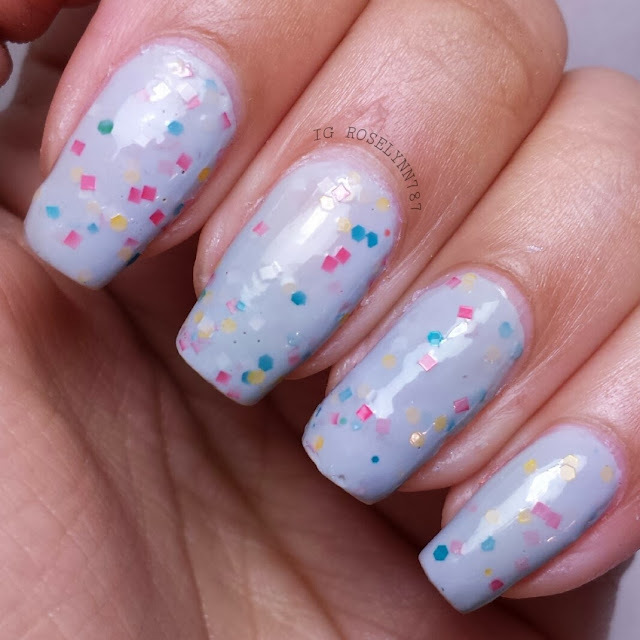 Pink Cloud Sunset is a grey based crelly filled with pink and purple hex glitters. I'm starting this review out with my favorite one from the collection. I absolutely love the color contrast between the grey and the bright pink and purple. It compliments each other really well. Swatched over a clear base, used three thin coats, and sealed with a fast drying topcoat. The application for this one is the other half of why this is my favorite. The suspension worked extremely well, there was no fishing for glitters. It'll be sheer in one coat but three should make it reach full opacity. 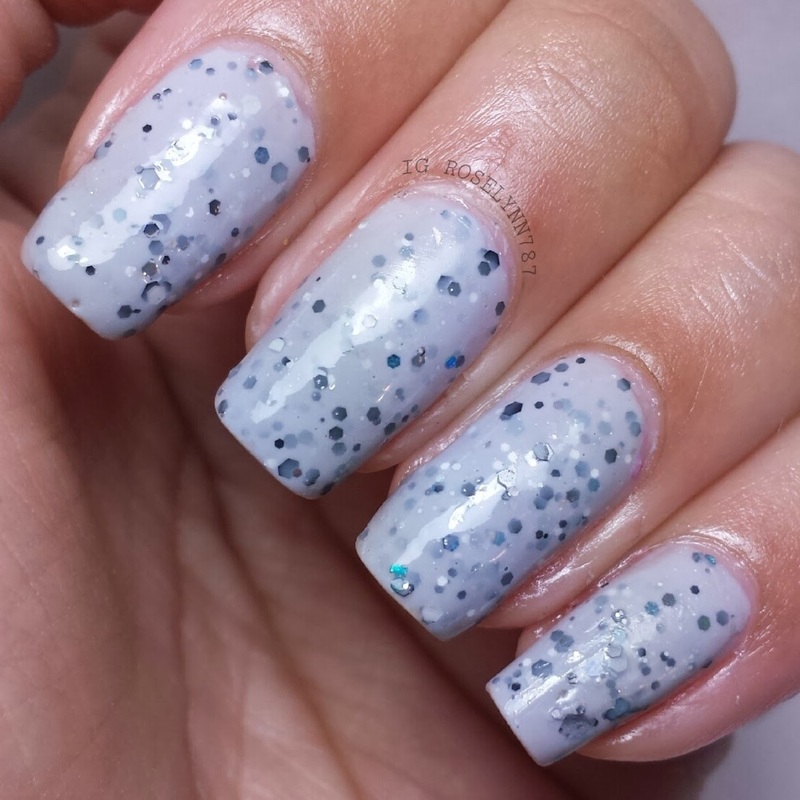 Next is Partly Cloudy a grey based crelly filled various blue squared glitters. This cutie makes me think of two things clouds and rain. This was a close second to being my favorite. The color combination makes me want to use it as a base for nail art in the future. Swatched over a clear base, used three thin coats, and sealed with a fast drying topcoat. Just like the prior polish I mentioned, it had a pretty good application and no glitter fishing. Full opacity was achieved in three thin coats, first coat is very sheer. 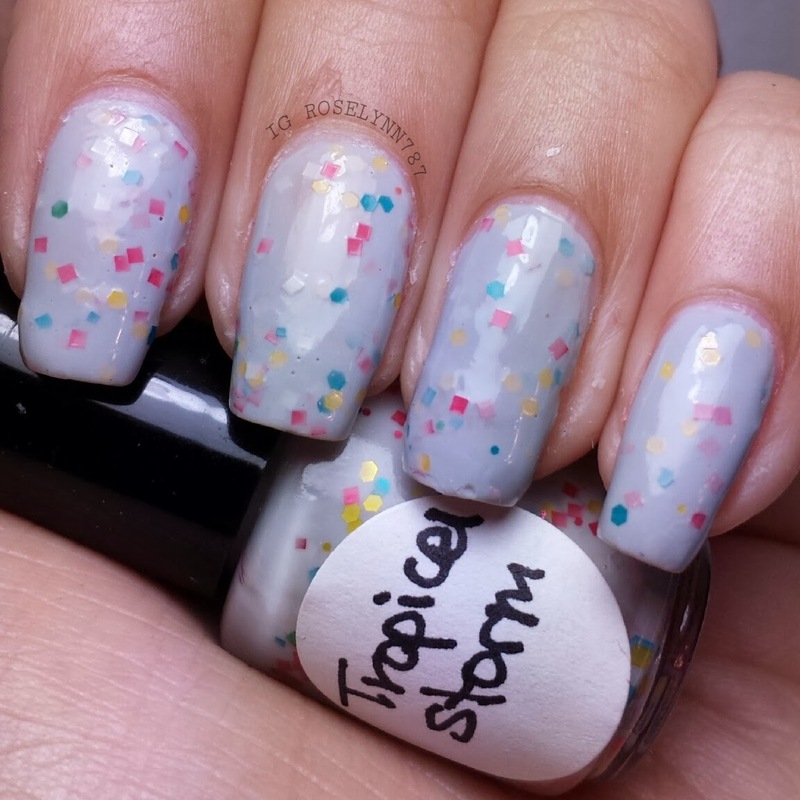 Next we have Tropical Storm, another grey crelly filled with multi-colored squares. I wanted this one to be my favorite when I first saw the color combination but unfortunately it was not meant to be. Swatched over a clear base, used three thin coats, and sealed with a fast drying topcoat. The application for this one was a little lack luster. In comparison to the other ones, I'd say you will find yourself having to do a bit of glitter fishing (at least in the mini bottles). 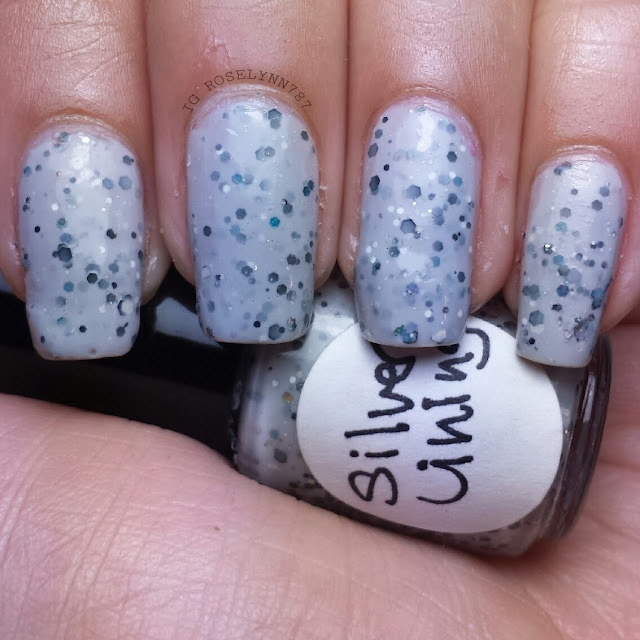 And lastly we have Silver Lining, a grey crelly filled with various grey and black circular glitters. The classic grey scale color scheme. I love it! I was hoping this collection would just have a straight grey one and very pleased with the one it has. 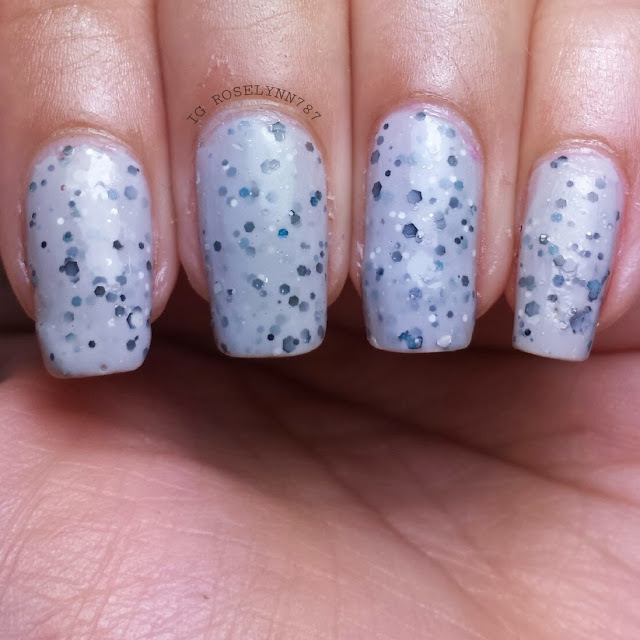 Swatched over a clear base, used three thin coats, and sealed with a fast drying topcoat. 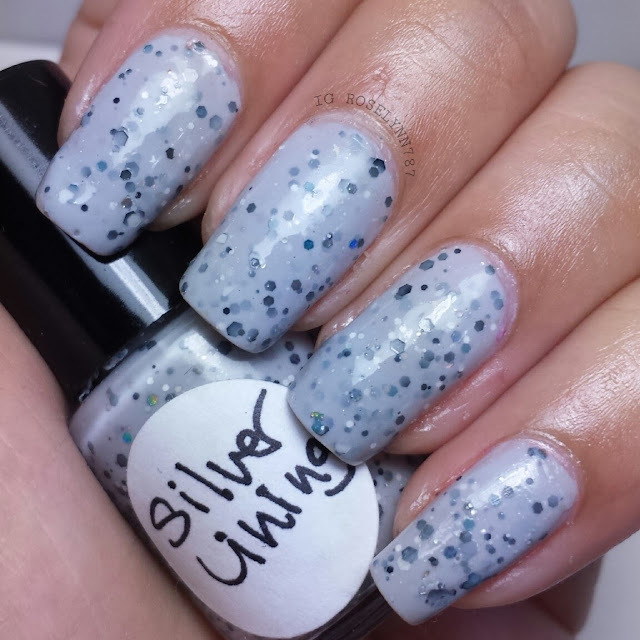 The application for Silver Lining was better than the previous polish but not by much when it came to the bigger glitters. It was impossible to fish the bigger ones out of the mini bottles. It's a shame too because I feel those bigger ones really add a nice touch. Overall I absolutely that they are all grey-based but at the same time I can see why this would not appeal to some ladies. I have been actually looking for a collection like this for a while and I'm happy with the variation found here. Unfortunately some of the application process did suffer due to these being in mini bottles. Stefanie did address this issue and these same mini bottles will not be used any longer. I definitely recommend this collection for anyone looking to break out of the same ol' color cycle and try something different. 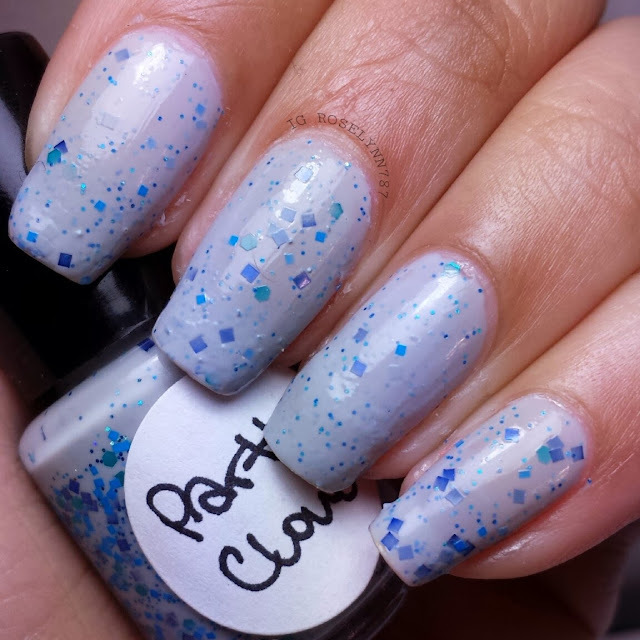 Be sure to follow Supernatural Lacquer on Facebook and (https://facebook.com/SupernaturalLacquer) Instagram (http://instagram.com/supernatural_lacquer#) for store updates and stock information. 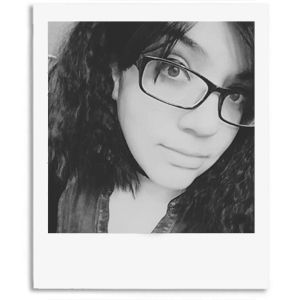 Found you on the blog hop so just thought I'd say hi! 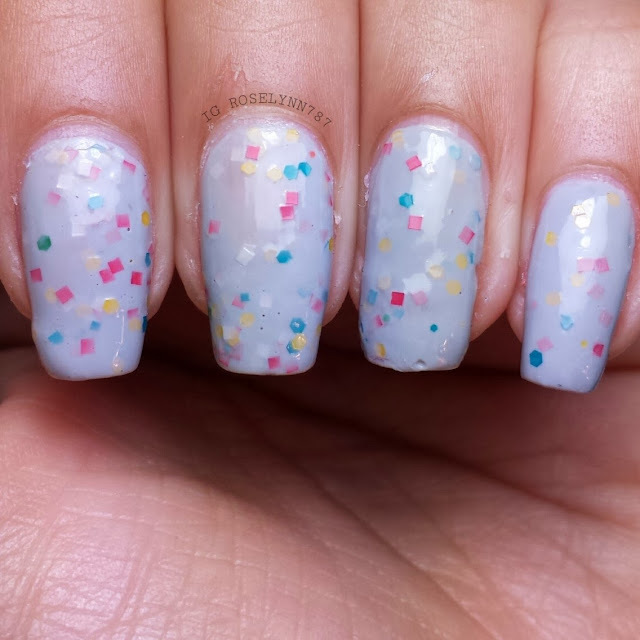 You have such great looking nails, how do you get them that long (or are they fake?) lovely nail designs too :) and I like your nail tattoo! I'm game for glitter and the grey base!! !